Welcome to Fergworld, a flying and aviation extravaganza! As a freshly minted private pilot, aircraft, single-engine land (ASEL) I found my newfound flying freedom to be fun and invigorating. After so much hard work and commitment, I was thrilled to have the option to actually fly somewhere new: interesting destinations that once seemed distant were now tantalizingly close. Better yet, I could bring my wife along for the ride instead of my CFI. I quickly added high-performance, complex, and even taildragger endorsements to my logbook. And I flew many hours for many weekends. While I still enjoyed making cross-country weekend trips to new locations, I started to hunger for a new challenge – and the sense of satisfaction that my completed FAA private pilot checkride had given me. "So, here's the deal for all of you pilots who've wondered what it's like to fly a twin, but haven't had the opportunity. First, my impressions are as follows: 1) It's very much the same, and 2) It's completely different." 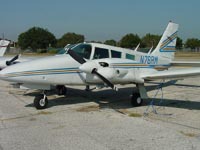 The multi-engine rental aircraft on my FBO's ramp looked sleek, fast, and complicated. I would peer into the window and wonder how different the big throttle quadrant would feel under my hand instead of the relatively puny push-pull throttle and prop controls I was accustomed to in the trusty Cessna 182. And all of those switches! There seemed to be a maze of them. I wondered how hard it would be start an airplane with two engines instead of one. And I pondered how different it would be to actually fly one of these beasts, from takeoff, to cruise, to landing back on the runway. Okay. So, here's the deal for all of you pilots who've wondered what it's like to fly a twin, but haven't had the opportunity. First, my impressions are as follows: 1) It's very much the same, and 2) It's completely different. Why the opposing views? Well, when a multi-engine aircraft is flying on two engines (and hopefully, this will be the case all the time unless you are training), it flies pretty much like any normal airplane. Sure, it's bigger. Yes, it's heavier and required control inputs require a bit more pressure on the yoke and pedals. You do carry power on final approach, which was a lot different from the days of slowly coasting in at 65 knots in a Cessna 172. Climb performance in a twin is greatly improved due to the two spinning props, but you won't necessarily cruise faster – remember, there's a lot more airplane to drag through the sky. All in all it flies pretty much the same – until you lose an engine. Ah, but I'm getting ahead of myself. Let's do a thorough pre-flight inspection, hop into the cockpit and fire this baby up.